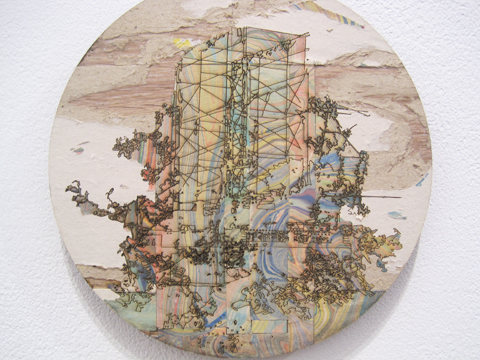 The pick of the best exhibiting artists at the Jerwood Drawing Prize exhibition this year. Including prize-winning work from Virginia Verran and Cadi Froelich. 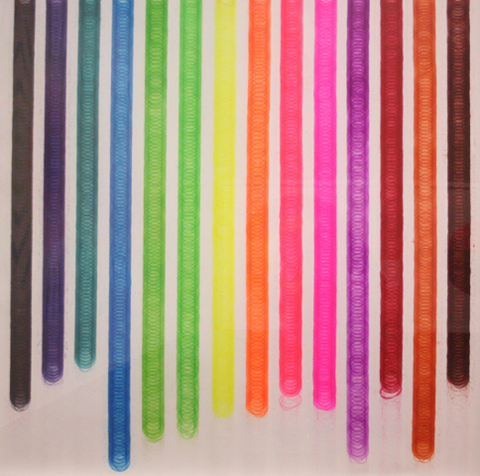 Detail of Drip, information pills 20 Assorted Colour Inks by Lesley Halliwell. The Jerwood Drawing Prize opened a few weeks ago with a suitably boozy party that I attended for just long enough to swing around the exhibits. The prize was set up to challenge what constitutes ‘drawing’ and there was plenty of painting, 3D abstract art, embroidery – the wonderful Tattoo Face by Julie Cockburn – and even a sculpture on display. In fact, the sculpture, which I paid little attention to, won second prize. What does tie the whole shebang together is the delicacy of production. Everything is carefully considered, finely rendered and inherently beautiful, making it an unmissable exhibition for anyone working in the illustrative or fine arts. 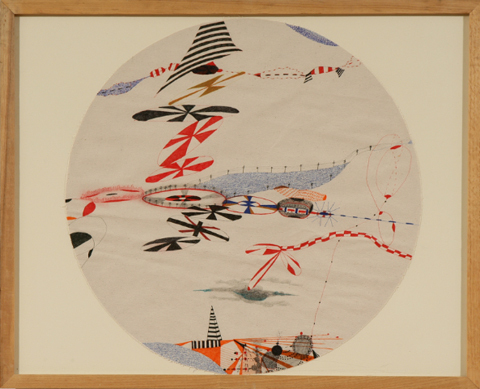 First prize went to a gorgeous abstract round painting in felt tips called Bolus-Space (Signal) by Virginia Verran, a fine art tutor from Falmouth University. I find it heartening that a tutor should win this award because so often those who teach don’t find the time to do themselves. Virginia has shown other recent work at the Emma Hill Eagle Gallery. 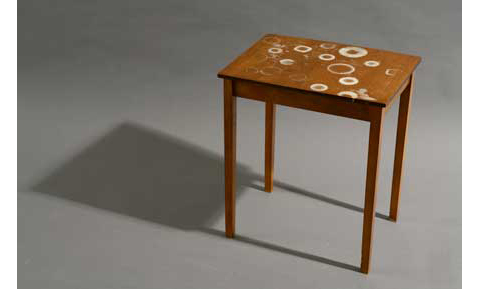 Cadi Froelich won the second prize with her Untitled (tea table). Cadi is a bit of an enigma: still completing a foundation degree in Brighton, despite having exhibited “internationally”. If anything pushed the conventional boundaries of what it means to draw, this ring marked piece was certainly it. Student prizes were won by Warren Andrews and the double act of James Eden & Olly Rooks, though I have no idea what their submissions were as I didn’t make a note of them. 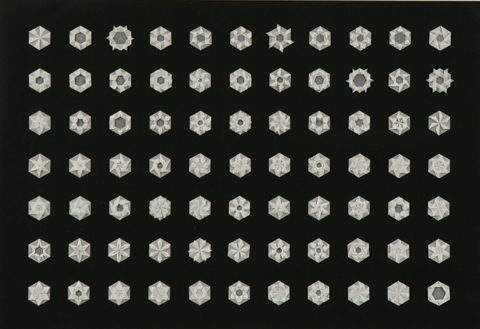 Naoko Miyazaki shows a delicate paper abstraction entitled Geometrical Lyricism. 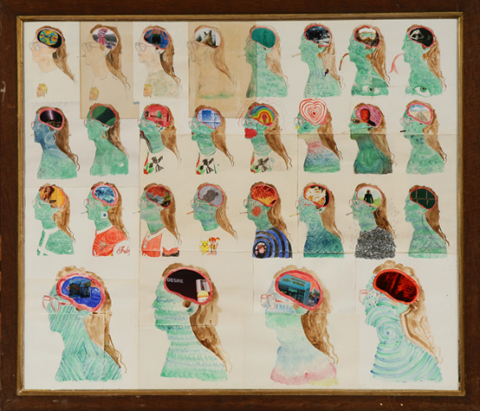 Michael O’Mahony’s long haired portraits feature the random thoughts of a multi-hued brain. I like the addition of a fag. 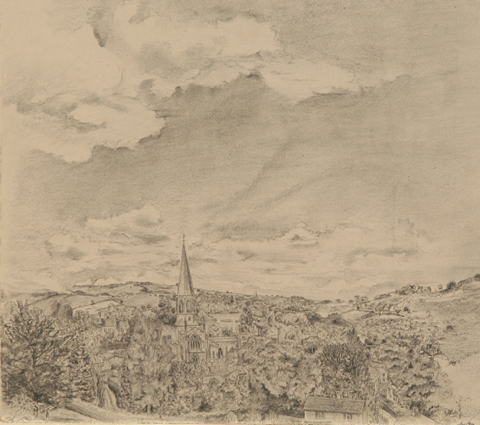 Wandering, is a more traditional entry – a beautiful fuzzy grey penciled drawing of a church from Ben Meschko. 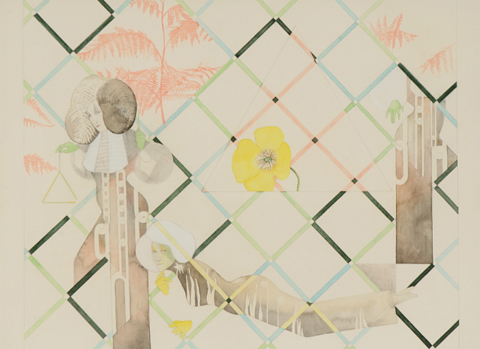 Poppy by Donna Huddleston is an art deco influenced abstraction of some lady figures… almost fashion plate-esque. Pale and beautiful. 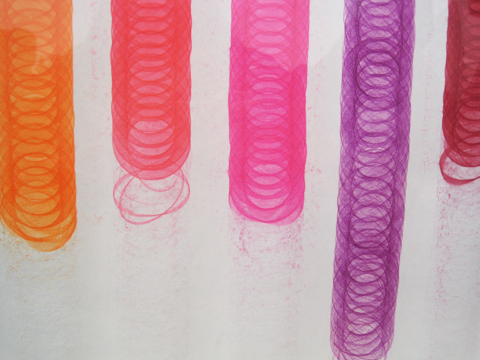 Lesley Halliwell has gone crazy with the spirograph to fabulous effect, producing Drip, 20 Assorted Colour Inks in garish multicolour. 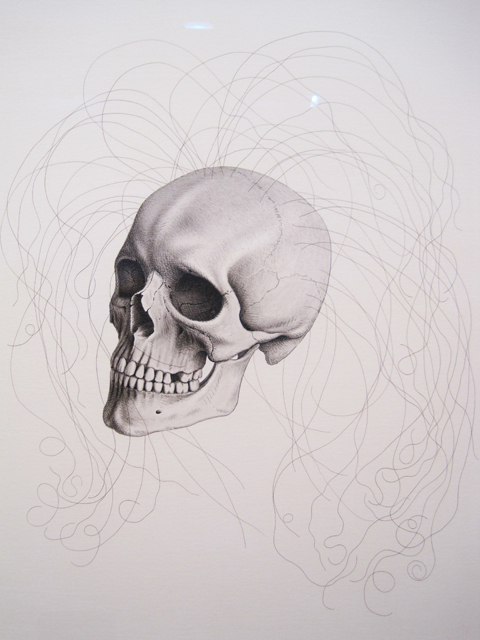 Martin Huxter chose that artist’s favourite, the human skull, this time embellished with real human hair in The Very Hairs From My Lady’s Head. Disconcerting and intriguing. 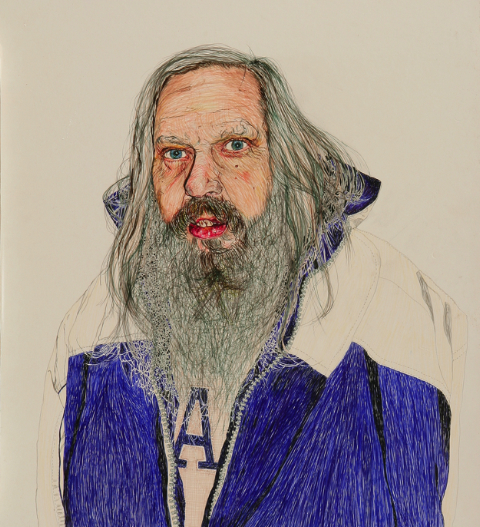 Raji Salan illustrates a wild bearded man in felt tip pens for Homeless Man. He wears a baggy old shell suit that almost, but not quite, overwhelms his hair… however it’s the unexpected red lushness of his lips that really stands out. 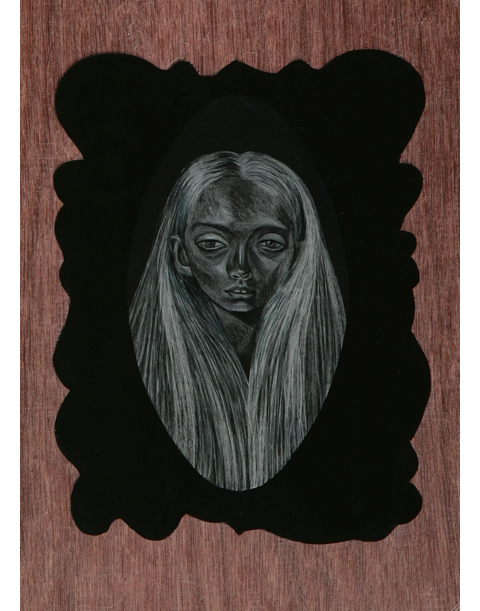 Hannah Wooll’s portrait is of an altogether more kitsch inspired ilk: heavily pencilled hair engulfing a small elfin face within a grainy wood frame. 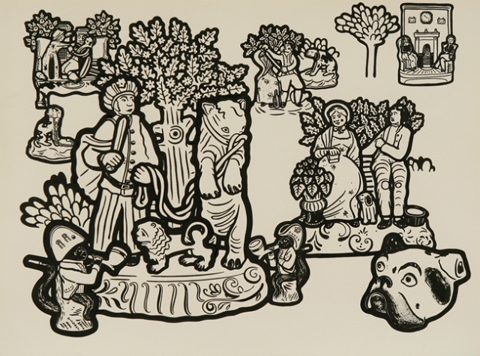 Laura Moreton-Griffiths has put together a beautiful woodblock-esque panorama of Street Life, though closer inspection shows that it is rendered in indian ink. Louise Schmid’s Apes Nous is an intriguing abstraction in pretty colours . 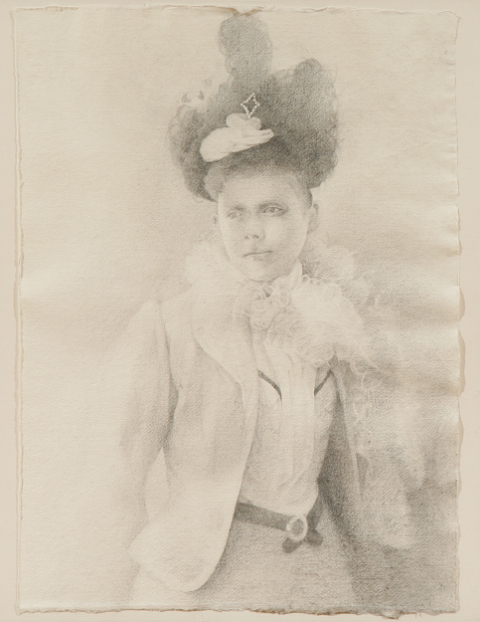 Yuma Tomiyasu’s Untitled (Unknown 3, Victorian) pretty much does what it says on the tin. The Victorian bit that is; a beautiful dainty image. 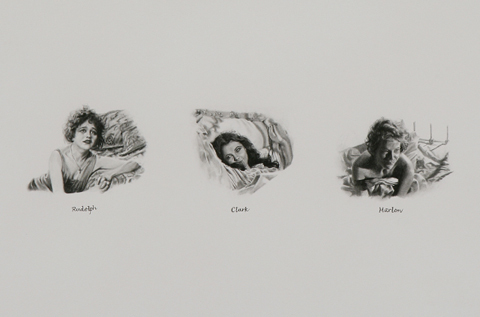 Nina Fowler has likewise produced a beautiful drawing of three women, Submission, in sharply defined pencil relief. What is their connection? We shall never know why they look so yearning. An old fashioned looking rendition of a beach is placed side by side with a blank section for Paul Fieldsend-Danks work The Garden of Sleep, which includes charcoal dust in it’s ingredients. 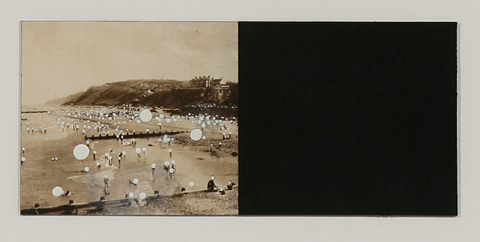 Orb-like white blobs hover over the crowds. Another street scene comes from Michael Page. 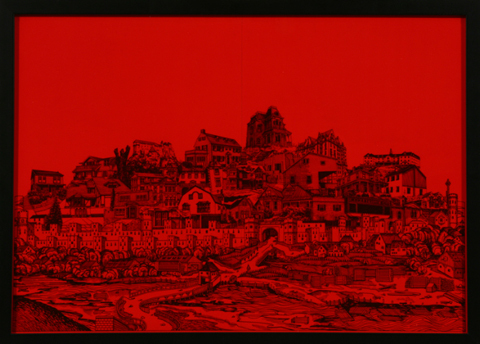 His Twenty-six Horror Houses are shown piled on top of each other against a bloody ketchup red backdrop. 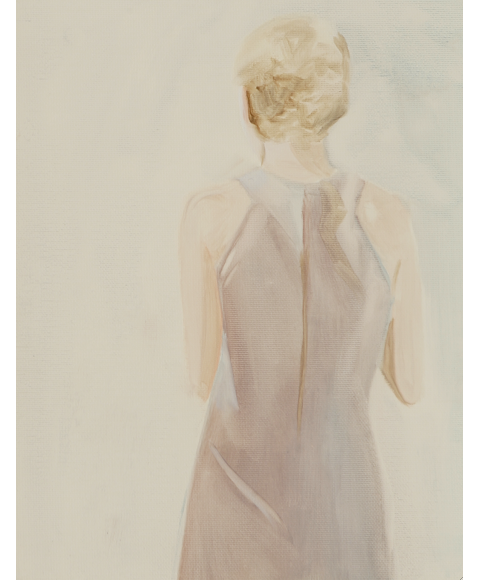 Amelia’s Mag favourite Cathy Lomax was spotted at the exhibition loitering as far away as possible from her beautiful but long titled work Outfit 38: Taupe Linen, Sleeveless Dress with Racer Back and Back Zip (Castevets’ New Years Party). Cathy runs the Transition Art Gallery, Garageland magazine and the Arty fanzine. She’s a veritable whirlwind of artistic talent. 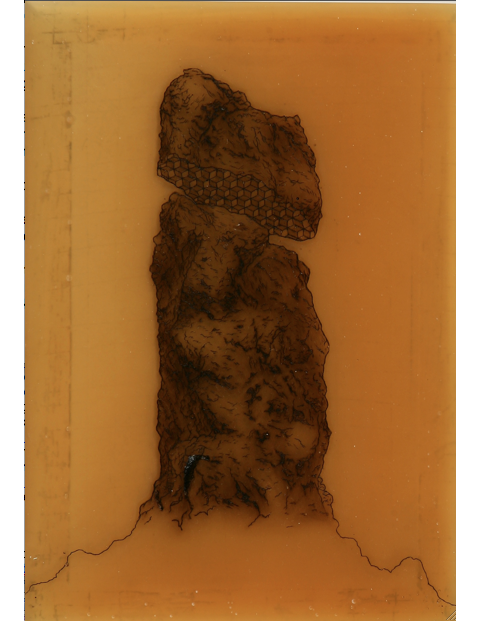 The Way of the Future by Chris Agnew is a curious thing, an etching on resin, glowing as if alive with the power of a sacred megalith. 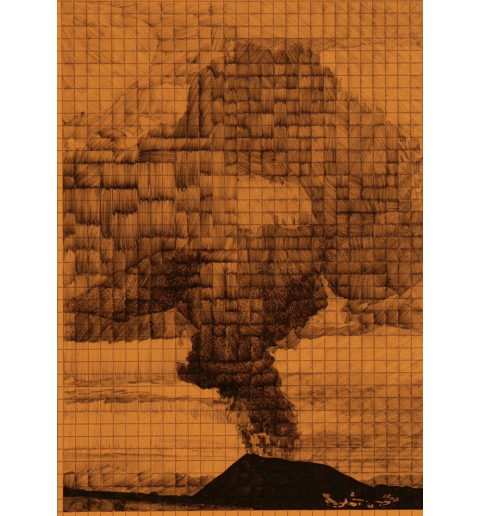 A similarly orange work, Ash Cloud, from Edward Lawrenson must surely have been inspired by the wonderful antics of Icelandic volcano Eyjafjallajökull. Last, but not least, Srinivas Surti’s Joss Stick Billboard is a laser cut collage created on a laminate floorboard to evoke a surreal post-apocalyptic half decaying tower block. 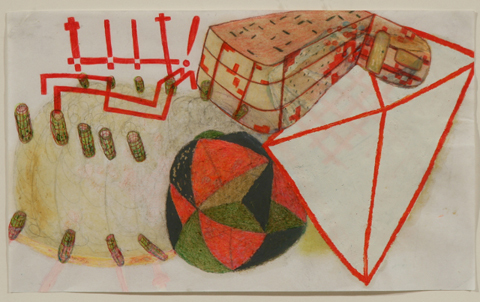 Drawing, but not as we traditionally know it. The exhibition runs until 7th November and all further details can be found on our previous listing. Highly recommended. Beautiful and inspiring, thank you for this. Warrens entry was a small sculptural piece and Olly and my entry was in video form. It reminds me of my BA in drawing where I was the only one actually marking paper with fine instruments, everyone else was theoretical and suitably abstract… WTF? Shouldn’t drawing be about drawing? Is it the “emperor’s clothes” or what? This is a link to the JVA site, with images of all the prize winners. James, glad to see that all those years alone in your bedroom have enabled you to copy photographs with a biro. Try and think of art, drawing as being something which changes, progresses – both looking back to the past and proposing something for the future?